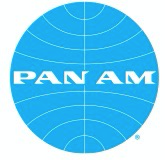 22 January 1970: Captain Robert M. Weeks and crew flew the Pan American World Airways Boeing 747-121, N736PA, Clipper Young America, New York to London on a 6 hour, 43 minute inaugural passenger-carrying flight of the new wide-body jet. Aboard were a crew of 20 and 335 passengers. This painting showing the arrival at London Heathrow Airport, is by John T. McCoy. The 747-100 is powered by four Pratt & Whitney JT9D-7A turbofan engines which can produce 47,670 pounds of thrust, each, with water injection (2½ minutes). Its cruise speed is 0.84 Mach (555 miles per hour, 893 kilometers per hour) at 35,000 feet (10,668 meters) and it’s maximum speed is 0.89 Mach (588 miles per hour/946 kilometers per hour). The maximum range at MTOW is 6,100 miles (9,817 kilometers). 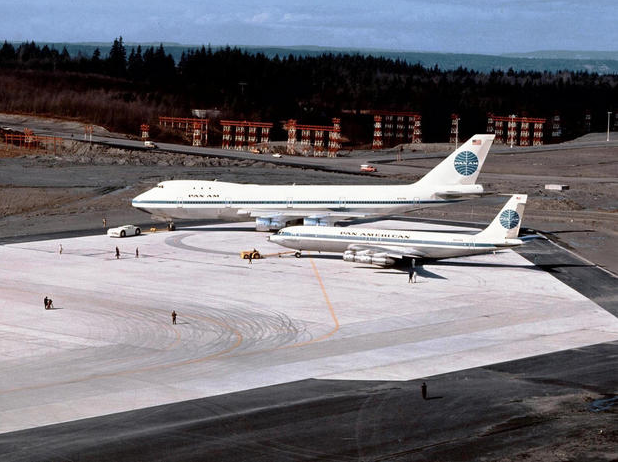 The 747 has been in production for 49 years. As of December 2018, 1,548 747s of all models had been built. 205 of these were 747-100 series aircraft. 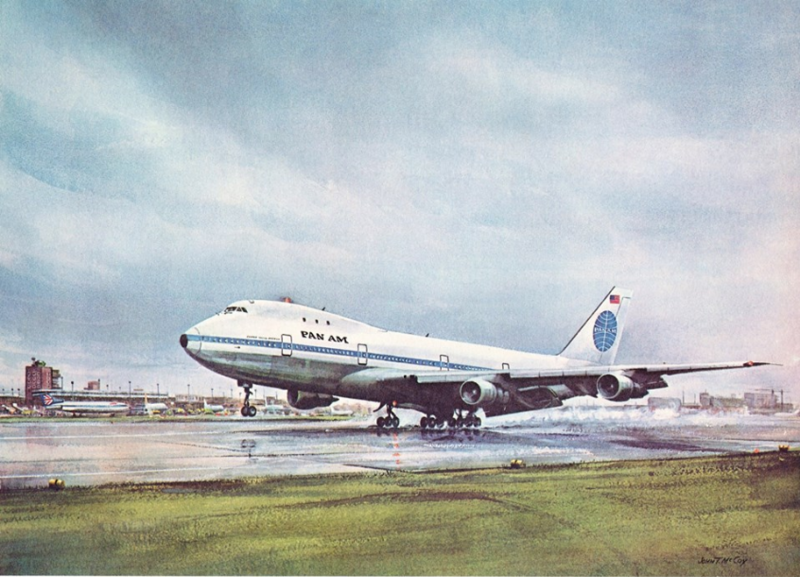 N736PA had initially been named Clipper Victor, but the name was changed to Clipper Young America for the inaugural New York to London flight when the 747 scheduled to make that flight—Clipper Young America—suffered mechanical problems. 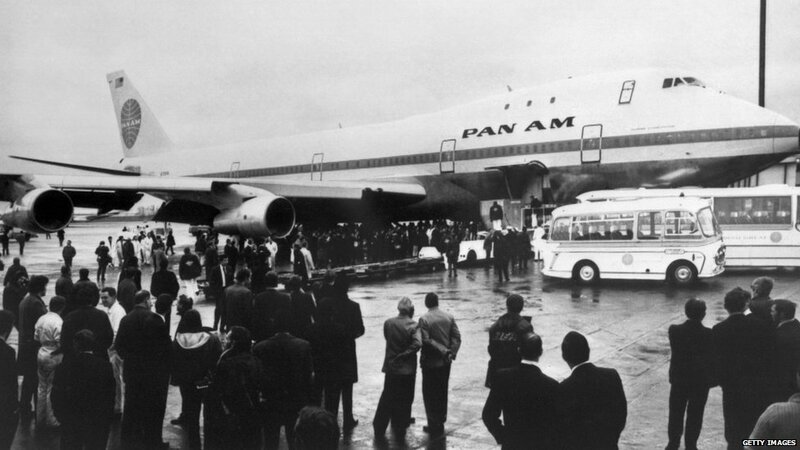 The 747 was hijacked on 2 August 1970 and flown to Cuba. After that incident, N736PA was renamed Clipper Victor — its original name. It was destroyed in a collision with another Boeing 747 at Tenerife, Canary Islands, 27 March, 1977. 26 November 2003: Concorde 216, G-BOAF, made the final flight of the Concorde fleet when it flew from London Heathrow Airport (LHR) to Bristol Filton Airport (FZO) with 100 British Airways employees on board. 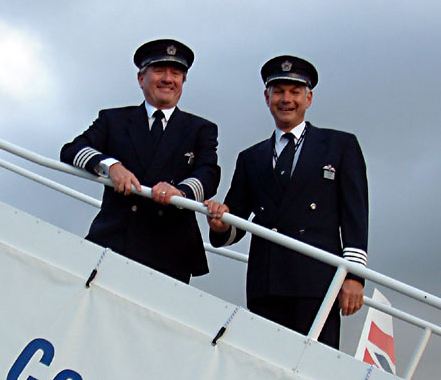 The aircraft was under the command of Captain Les Brodie, with Chief Pilot Captain Mike Bannister and Captain Paul Douglas, with Senior Flight Engineers Warren Hazleby and Trevor Norcott. The duration of the flight was just over 1 hour, 30 minutes, and included both supersonic and low-altitude segments. Concorde 216 was the last of twenty Concordes to be built. It was originally registered G-BFKX and made its first flight at Bristol Filton Airport, 20 April 1979. The new airliner was delivered to British Airways 9 June 1980 and was re-registered G-BOAF. “Alpha-Foxtrot” had flown a total of 18,257 hours by the time it completed its final flight. It had made 6,045 takeoffs and landings, and had gone supersonic 5,639 times. G-BOAF was placed in storage at Filton. 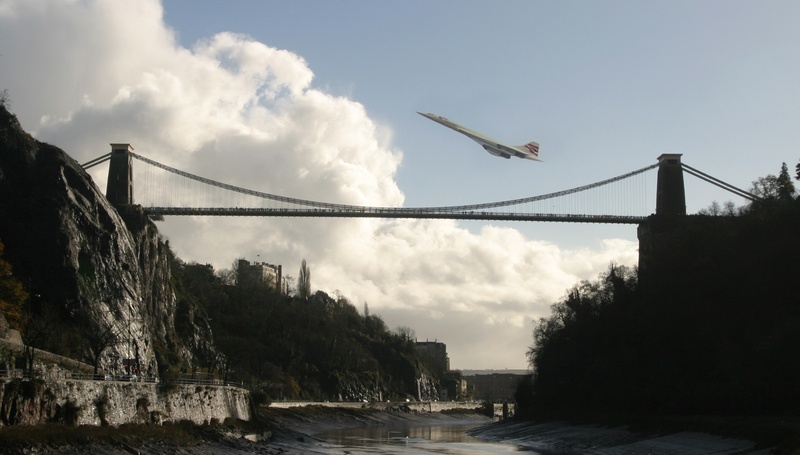 It is intended as the centerpiece of Bristol Aerospace Centre, scheduled to open in 2017. 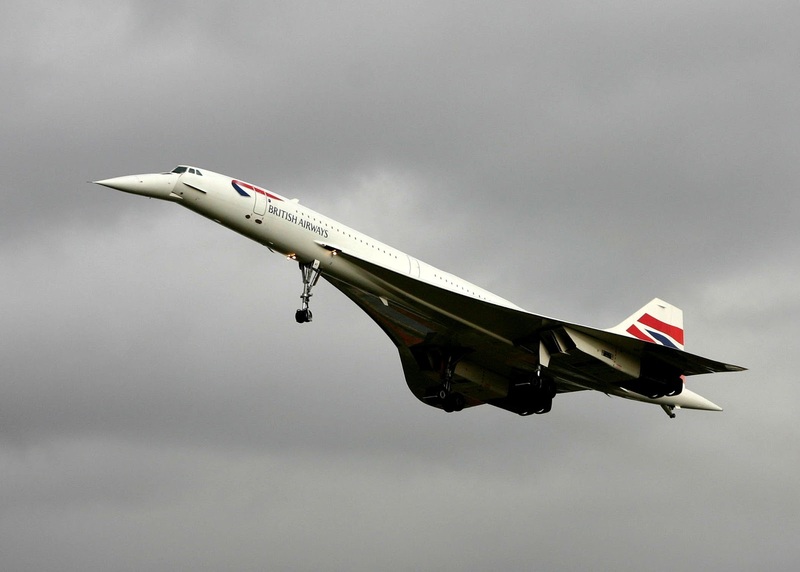 The Concorde supersonic transport, known as an “SST,” was built by the British Aerospace Corporation and Sud-Aviation. There were six pre-production aircraft and fourteen production airliners. British Airways and Air France each operated seven Concordes. It was a Mach 2+ delta-winged intercontinental passenger transport, operated by a flight crew of three and capable of carrying 128 passengers. The production airliners were 202 feet, 4 inches long (61.671 meters) when at rest. During supersonic flight the length would increase due to metal expansion from frictional heating. The wingspan was 83 feet, 10 inches (25.552 meters) and overall height was 40 feet (12.192 meters). The fuselage was very narrow, just 9 feet, 5 inches at the widest point. The Concorde has an empty weight of 173,500 pounds (78,698 kilograms) and a maximum takeoff weight of 408,000 pounds (185,066 kilograms). The Concorde is powered by four Rolls-Royce/SNECMA Olympus 593 Mk.610 afterburning turbojet engines. The Olympus 593 is a two-shaft, axial-flow engine with a 14-stage compressor section (7 low- and 7 high-pressure stages), single combustion chamber and a two-stage turbine (1 low- and 1 high-pressure stage). The Mk.610 was rated at 139.4 kilonewtons (31,338 pounds of thrust), and 169.2 kilonewtons (38,038 pounds) with afterburner. During supersonic cruise, the engines produced 10,000 pounds of thrust ( kilonewtons, each. The Olympus 593 Mk.610 is 7,112 meters (23 feet, 4.0 inches) long, 1.212 meters (3 feet, 11.72 inches) in diameter, and weighs 3,175 kilograms (7,000 pounds). The maximum cruise speed is Mach 2.05. Concorde’s operating altitude is 60,000 feet (18,288 meters). Maximum range is 4,500 miles (7,242 kilometers). 17 November 1946: A modified Avro 691 Lancastrian C.1, VH742, under the command of Rolls-Royce’s chief test pilot, Captain Ronald Thomas Shepherd, O.B.E., flew from London Heathrow Airport (LHR) to Aéroport de Paris – Le Bourget (LBG) for 17th Salon de Aviation (Paris Air Show) with two Rolls-Royce RB.41 Nene Mk.I turbojet engines for propulsion. The airplane’s two Rolls-Royce Merlin V-12 piston engines were shut down, except for takeoff and landing, and their three-bladed propellers were feathered to reduce drag. It was the first-jet-powered passenger transport to fly from one country to another. THE flight of the Nene Lancaster from London to Paris last Monday, to play its part in connection with the exhibition, may be said to have marked a historic part in British aircraft development, for it constituted the first time that any jet-powered airliner had flown from one country to another. Moreover, since this particular aircraft has been flying fairly regularly since round about the time of the Radlett exhibition, the flight to Paris was no special performance, but merely one more public demonstration of its inherent reliability. In the hands of Capt. R. T. Shepherd, chief test pilot for Rolls-Royce, the “Nene-Lanc” landed at Le Bourget at 10.58 a.m., G.M.T., after a 50-minute flight from London Airport, giving an average speed of 247.5 m.p.h. [398.3 kilometers per hour] Two passengers were carried in addition to the crew; they were Mr. Roy Chadwick, the Avro designer, and Mr. R. B. William Thompson, Chief Information Officer of the Ministry of Supply. Capt. Shepherd said that he was very pleased with the aircraft’s performance and added that, but for having to circle Le Bourget Airport Twice before landing, the flight would have been completed in 43 minutes. — FLIGHT and AIRCRAFT ENGINEER, No. 1978. Vol. L., Thursday, November 21st, 1946 at Page 561, Column 2. THE return of the Nene Lancastrian on Nov. 22nd, direct from Le Bourget to Heathrow, was made in only 49 min, including landing, actual flying time from point to point being 41 min—an average speed of 322 mp.h. [518.2 kilometers per hour] This remarkable performance was in spite a beam wind and the dead weight and drag of the two inboard Merlins, which are only used for takeoff and landing. Passengers of the return trip included Mr. Roy Chadwick, chief designer and a director of A. V. Roe and Co., Air Comdre. Kirk and Air Comdre. Pike. —FLIGHT and AIRCRAFT ENGINEER, No. 1979., Vol. L., Thursday, November 28th, 1946 at Page 588, Column 1. The Rolls-Royce RB.41 Nene engine first been run in October 1944. It installed in a Lockheed YP-80A Shooting Star, 44-83027, and the engine was first flown 18 July 1945 with Rolls-Royce test pilot Wing Commander John Harvey Heyworth, A.F.C., in the cockpit. The Nene-powered P-80 had made approximately 30 test flights when it was damaged beyond repair at RAF Syerston, 6 December 1945. With test pilot Andy McDowall flying, a fractured fuel pipe caused the engine to flame out from fuel starvation. McDowall tried to glide to a landing but another airplane was on the runway. He touched down on the grass but the landing gears were pushed up through the Shooting Star’s wings. The jet fighter had been too small to allow for adequate test equipment. A larger aircraft was needed. The R.A.F. assigned VH742 the role of test aircraft. The new Lancastrian arrived at the Rolls-Royce Flight Test Establishment at Hucknall Aerodrome, Nottinghamshire, 30 October 1945. The modification was engineered and the airplane was modified. The Lanc’s two outboard Rolls-Royce Merlin V-12 engines were removed and two Nene Mk.I engines were installed in underslung nacelles. The wing flaps were shortened by 3 feet, 4 inches (1.016 meters) and the ailerons by 10 inches (0.254 meters) to provide clearance from the jet engines’ exhaust. Sheet steel was installed on the lower surfaces of the wings as protect against the heat. Three fuel tanks were installed in each of the Lancastrian’s wings. The center tank contained gasoline for the Merlin engines, while the inner and outer tanks, plus two auxiliary tanks in the fuselage, carried kerosene for the jet engines. Fuel capacity was 760 gallons (2,877 liters) of gasoline and 2,420 gallons (9,161 liters) of kerosene. In the Lancastrian’s cockpit, additional instruments were installed for the turbojets: tachometers reading from 0–20,000 r.p.m. ; oil pressure gauges, 0–80 p.s.i. ; exhaust gas temperature, 400˚–750 ˚C., and exhaust gas pressure. The first flight of the modified VH742 took place 14 August 1946, with Ronnie Shepherd in the cockpit. 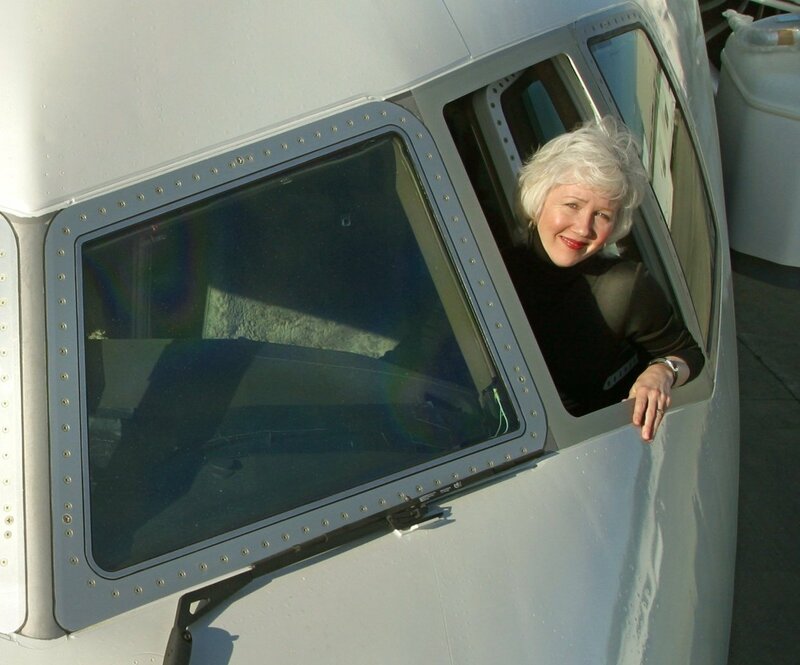 Running on the jet engines alone, the airplane was extraordinarily quiet and vibration free. Like all early turbojets, the Nenes were slow to accelerate from low r.p.m. Test pilots had to use caution. Jim and Harvey Heyworth also flew VH742 during the last half of August. The Rolls-Royce RB.41 Nene Mk.I was developed from the earlier RB.40 Derwent.¹ It was considerably larger and produced nearly double the thrust. It was a single-stage centrifugal-flow compressor/single-stage axial-flow turbine, rated at 5,000 pounds of thrust (22.24 kilonewtons) at 12,400 r.p.m. for takeoff. A second Nene-powered Lancastrian was added to the test fleet at Hucknall the following year. Last Nene flight took place in August 1949. 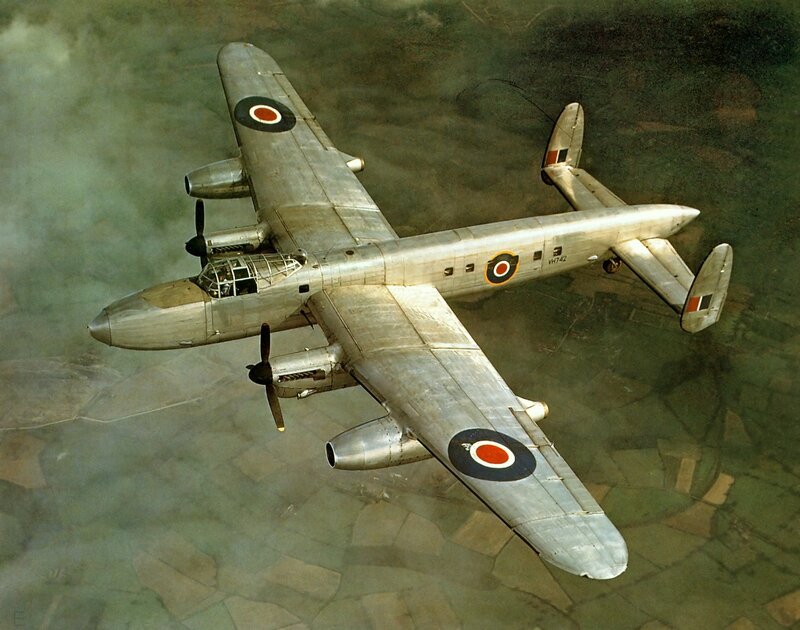 VH742 had been ordered by the Royal Air Force during World War II as an Avro Type 683 Lancaster B. Mk.III, a very long range heavy bomber, and assigned identity markings PD194. With the end of World War II in Europe, orders for hundreds of Lancaster bombers were cancelled. The partially completed PD194 was modified on the assembly line as a Lancastrian C. Mk.I passenger transport and renumbered as VH742. The Avro Type 691 Lancastrian was a four-engine civil transport based on the World War II very long range heavy bomber, the Avro Lancaster. The airliner was operated by a flight crew of four and carried one flight attendant. It could carry up to thirteen passengers. The Lancastrian was 76 feet, 10 inches (23.419 meters) long with a wingspan of 102 feet (31.090 meters) and overall height of 19 feet, 6 inches (5.944 meters). The empty weight was 30,220 pounds (13,707.6 kilograms) and gross weight was 65,000 pounds (29,483.5 kilograms). The Lancastrian Mk.III was powered by four 1,648.9-cubic-inch-displacement (27.04 liter) liquid-cooled, supercharged, Rolls-Royce Merlin T24/2 single overhead camshaft (SOHC) 60° V-12 engines producing 1,650 horsepower and turning three bladed propellers. The airplane a cruise speed of 245 miles per hour (394.3 kilometers per hour) and a maximum speed of 315 miles per hour (506.9 kilometers per hour). The service ceiling was 25,500 feet (7,772 meters) and the range was 4,150 miles (6,679 kilometers). 91 Avro Lancastrians were built, including modified Lancaster bombers. The transport variant first flew in 1943. 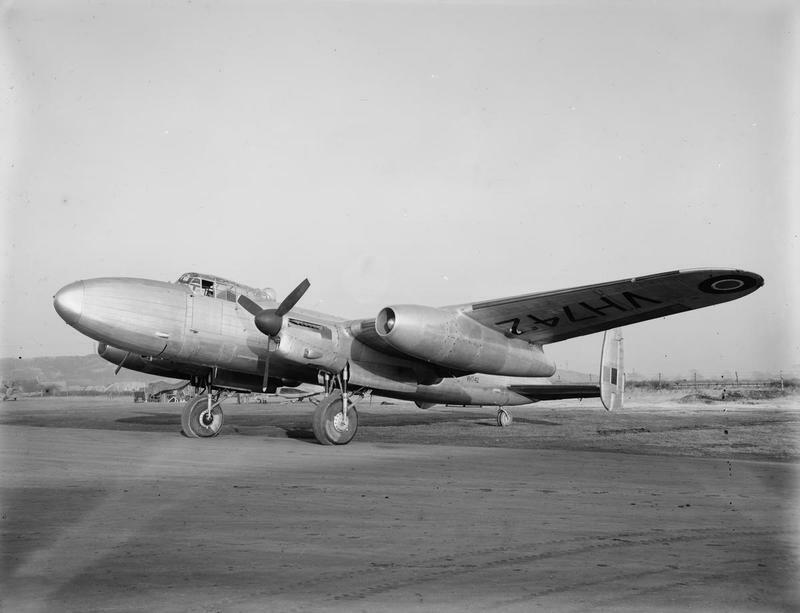 In addition to the Royal Air Force, commercial Lancastrians were operated by British European Airways, British Overseas Airways Corporation and British South American Airways. The last one was retired in 1960. 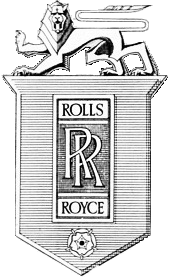 Rolls-Royce built more than 1,100 RB.41 Nene engines. It was licensed for production by Pratt & Whitney as the J42. Forty Nenes were sold to the Soviet Union under the condition that they would not be used for military purposes. These were reverse-engineered and produced as the Klimov RD-45 which powered the Mikoyan-Gurevich MiG-15 fighter. ¹ While Rolls-Royce named its piston-driven aircraft engines after birds of prey, the turbojet engines were named for rivers. 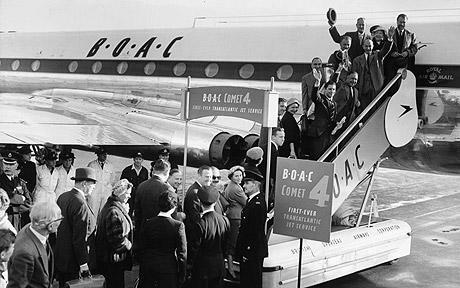 4 October 1958: The first regularly scheduled transatlantic passenger service with jet powered aircraft began when two British Overseas Airways Corporation (BOAC) de Havilland DH.106 Comet 4 airliners, civil registrations G-APDB and G-APDC, left nearly simultaneously from London Heathrow Airport (LHR) to Idlewild Airport (IDL), New York, and from New York to London. 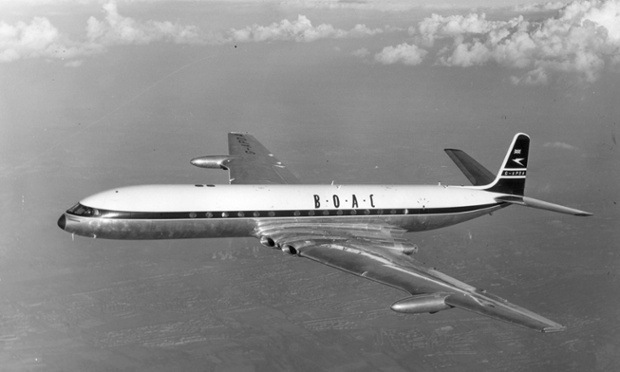 The west-to-east flight, (G-APDB) commanded by Captain Thomas Butler (Tom) Stoney, D.F.C., departed New York at 7:01 a.m., local time, with Basil Smallpiece and Aubrey Burke, managing directors of BOAC and de Havilland, respectively, on board. Benefiting from more favorable winds, the eastbound flight took just 6 hours, 12 minutes, averaging 565 miles per hour (909 kilometers per hour). The east-to-west airliner, G-APDC, departed Heathrow at 8:45 a.m., London time, under the command of Captain R.E. 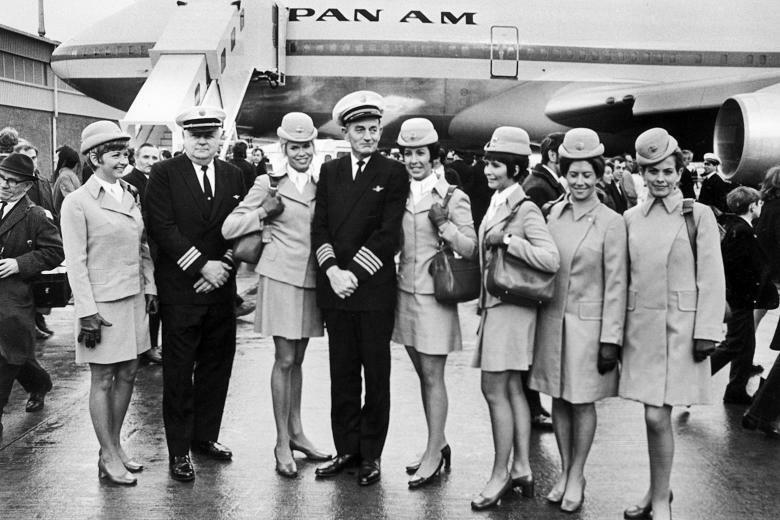 Millichap, with Sir Gerard d’Erlanger, chairman of BOAC, and 31 passengers aboard. The westbound flight took 10 hours, 20 minutes, including a 1 hour, 10 minute fuel stop at Gander Airport (YQX), Newfoundland. 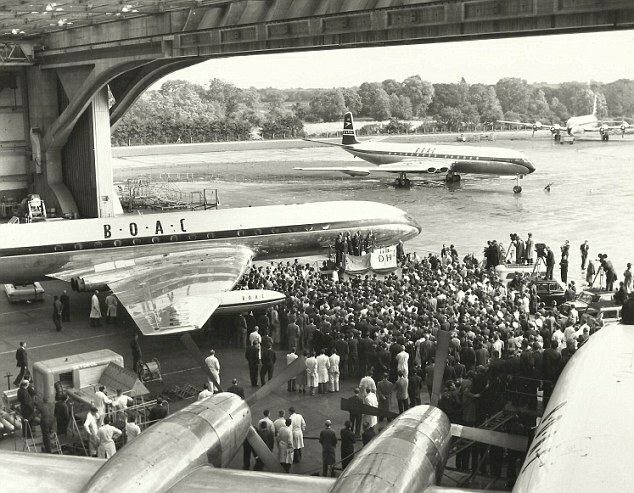 These two airliners had been delivered to BOAC on 30 September 1958. They were both configured to carry 48 passengers. The DH.106 Comet 4 was operated by a flight crew of four: pilot, co-pilot, flight engineer and navigator/radio operator. It could carry up to 81 passengers. The airliner was 111 feet, 6 inches (33.985 meters) long with a wingspan of 115 feet (35.052 meters) and 29 feet, 6 inches (8.992 meters) to the top of the vertical fin. Maximum takeoff weight of 156,000 pounds (70,760 kilograms). Power was supplied by four Rolls-Royce Avon 524 (RA.29) turbojet engines, rated at 10,500 pounds of thrust (46.71 kilonewtons) at 8,000 r.p.m., each. 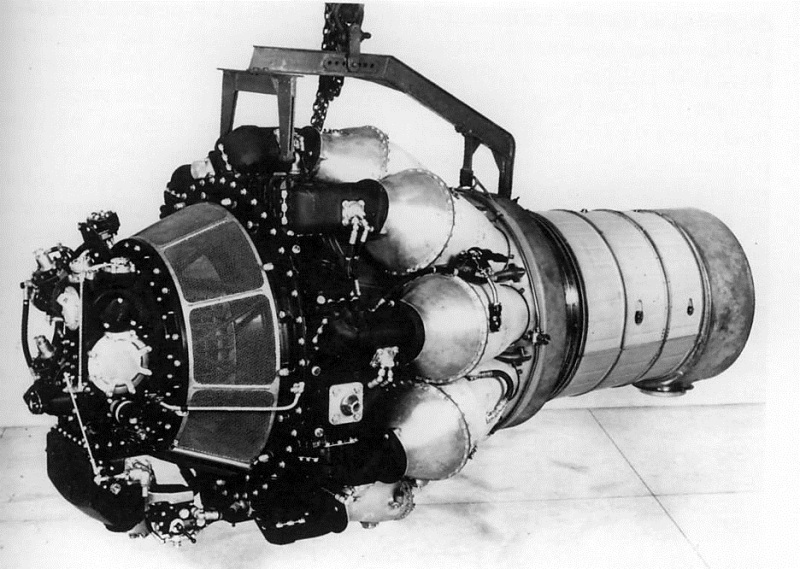 The RA.29 was Rolls-Royce’s first commercial turbojet engine. It was a single-spool, axial-flow jet engine with a 16-stage compressor and 3-stage turbine. The Mk.524 variant was 10 feet, 4.8 inches (3.170 meters) long, 3 feet, 5.5 inches (1.054 meters) in diameter, and weighed 3,226 pounds (1,463 kilograms). The Comet 4 had a maximum speed of 520 miles per hour (837 kilometers per hour), a range of 3,225 miles (5,190 kilometers) and a ceiling of 45,000 feet (13,716 meters). De Havilland DH-106 Comet 4 G-APDB (“Delta Bravo”) made it’s final flight on 12 February 1974, having flown 36,269 hours, with 15,733 landings. 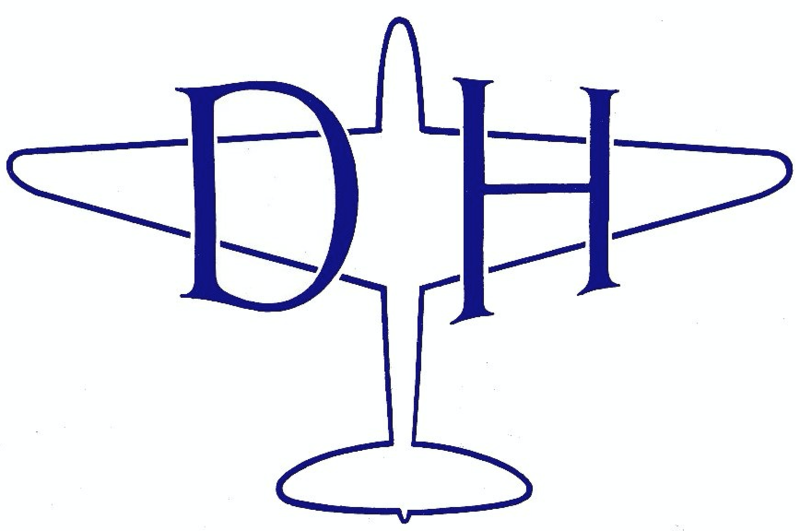 It is part of the Duxford Aviation Society’s British Air Liner Collection at RAF Duxford, Cambridgeshire, England. G-APDC did not fare as well. It was scrapped in April 1975. Captain Stoney had served in the Royal Air Force Volunteer Reserve during World War II. In 1942, as a Pilot Officer assigned to No. 58 Squadron, Bomber Command, he was awarded the Distinguished Flying Cross and promoted to Flying Officer. 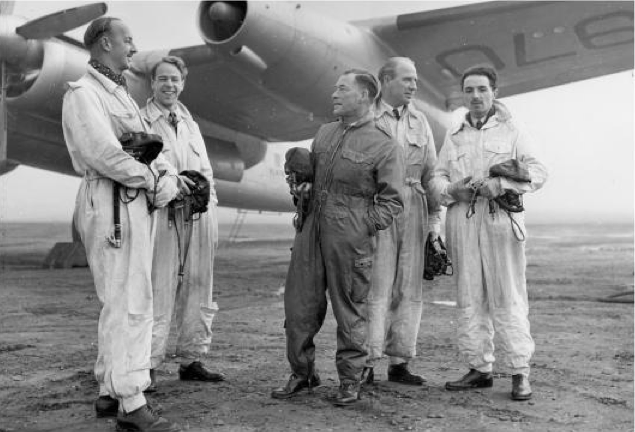 Ten years later, Captain Stoney was in command of BOAC’s Canadair DC-4M-4 Argonaut, Atalanta, G-ALHK, when it brought Queen Elizabeth II home from Kenya to accede to the throne.¹ Captain R.E. 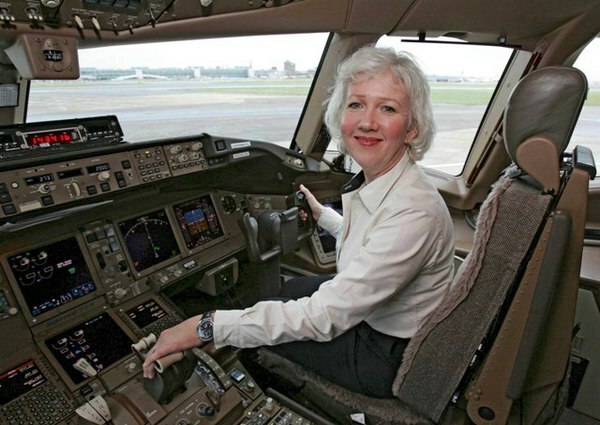 Millichap was also a member of the flight crew. 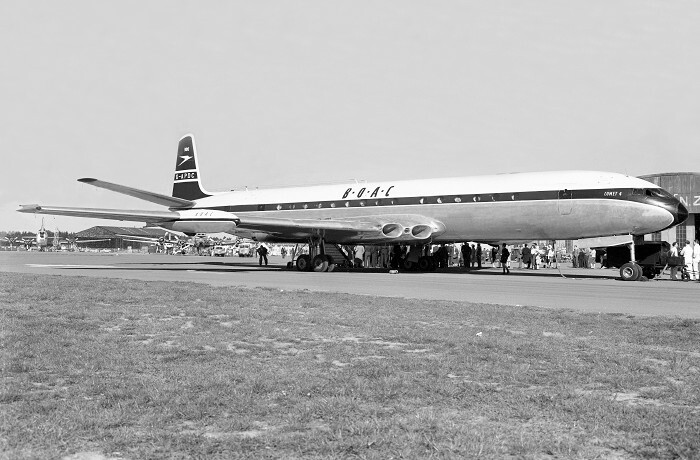 Later that year, Stoney flew the new Queen back to Africa aboard a DH.106 Comet 1. T.B. Stoney was appointed Officer of the Most Excellent Order of the British Empire in 1960.